Renee Schmitt Shang (’05 computer engineering) went into her senior year at Iowa State knowing that she already had a job waiting for her when she graduated. The job was working with image sensors at Micron, a company with which she’d interned after her junior year. She now works as a lead product engineer for Aptina, a Micron subsidiary, in Boise, Idaho, creating light-sensing imaging chips used in the cameras in many cell phones and action sports cameras as well as in the original X-box Kinect. The Rudd, Iowa, native says she derives a great deal of satisfaction from her job. 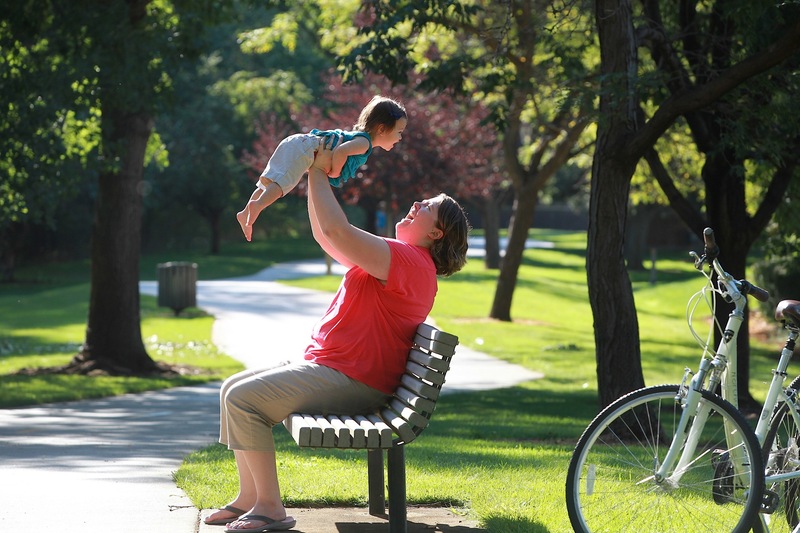 She met her husband, Mike, at Micron, and together they have an 18-month-old daughter, June. After living in San Jose, Calif., for a year, they are happy to be in Boise. Renee enjoys biking, rafting and tubing on the river, camping, and downhill skiing on the mountains surrounding Boise. After driving 30,000 miles across the United States over the past two years, Jim and I are happy to be back in Iowa. Our 50-state travels are completed. But we still have lots of stories to tell and photos to post, so don’t go away! I write this with a mix of sadness and joy: OUR MULTI-STATE TRAVELS ARE OVER. No more packing, no more rental cars, no more loading/unloading, no more airports, no more hauling equipment through airports – and, most significantly, no more cheap hotels with bad free breakfasts. 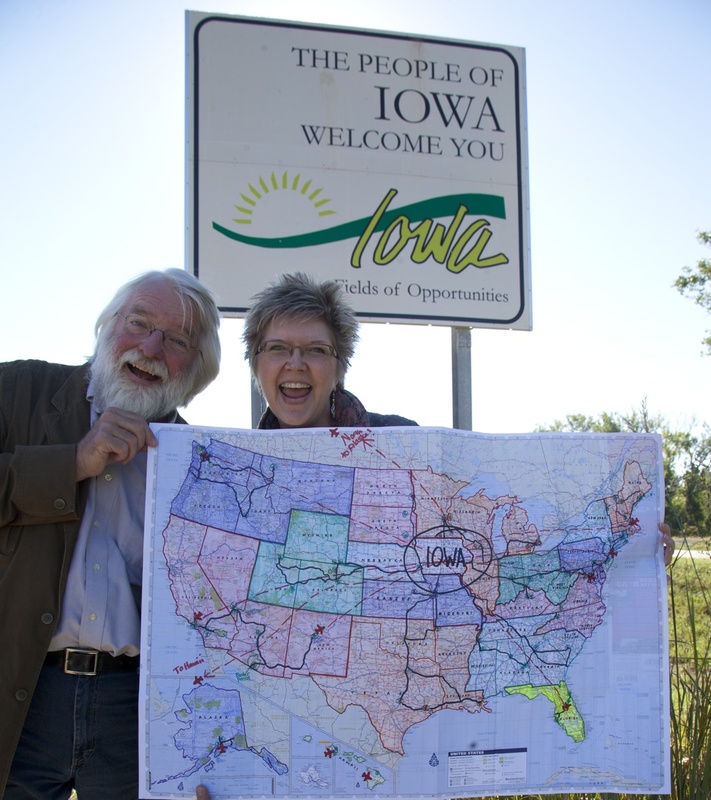 The VISIONS Across America travel team (Jim Heemstra and myself) is back home in Iowa after traveling to 49 states in 22 months – a total of 114 nights on the road. Jim and I finished with a bang last week, putting more than 3,500 miles on the rental car – the most miles we have accumulated on any single trip. We visited seven alumni in the states of Colorado, Utah, and Wyoming. This was a challenging trip to plan, especially when parts of Colorado received a year’s worth of rain the week before we were supposed to arrive. Two days before we were scheduled to leave Iowa, we scrambled to reconfigure our itinerary to give Colorado time to dry out and roads to be repaired. Thankfully, everything worked out OK. We met everyone we were supposed to meet – and we even got in to Rocky Mountain National Park between the time it was closed from the flooding and closed from this ridiculous government shutdown. Day 1: We drove all day to Denver, Colo. It’s a long way across Nebraska, and really there are no diversions even when you get into Colorado. Yawn. This afternoon we left Denver and drove to Steamboat Springs for the night. The drive was eventful: Pouring rain, snow on the other side of the Eisenhower Tunnel, two-lane mountain roads, more rain, and dense fog over Rabbit Ears Pass. And we also saw a moose. Day 3: Another full day’s drive, this time to Salt Lake City. Was it wrong of us to listen to the soundtrack to the Broadway musical “Book of Mormon” on the way there? Maybe, but it helped pass the time. 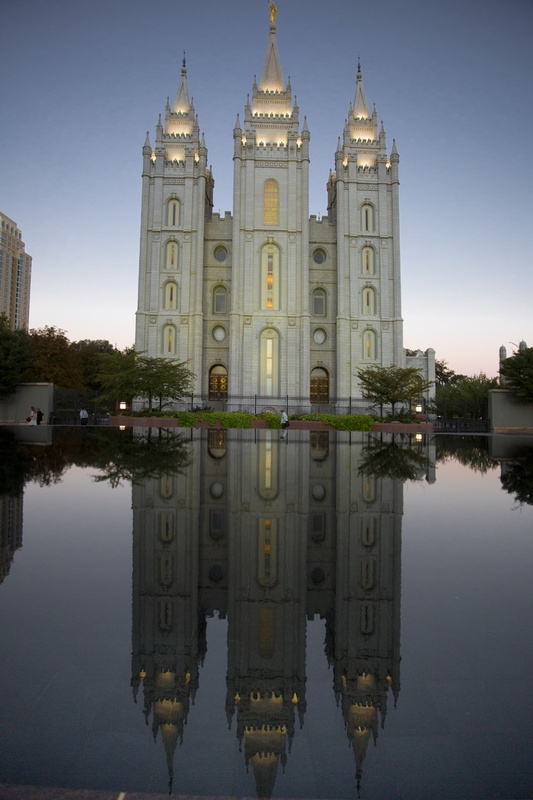 Day 4: We started the day with a walk to the 35-acre Temple Square in the heart of downtown Salt Lake City, an area that was nice and quiet in the early morning. The Temple reminded me a little bit of Cinderella’s castle at Disney World, although Jim’s picture makes it look more like the Taj Mahal. Afterwards, we checked out of our hotel without eating breakfast (bad or otherwise) because the alumni we were scheduled to meet with this morning offered to fix us a homemade breakfast. Yay! 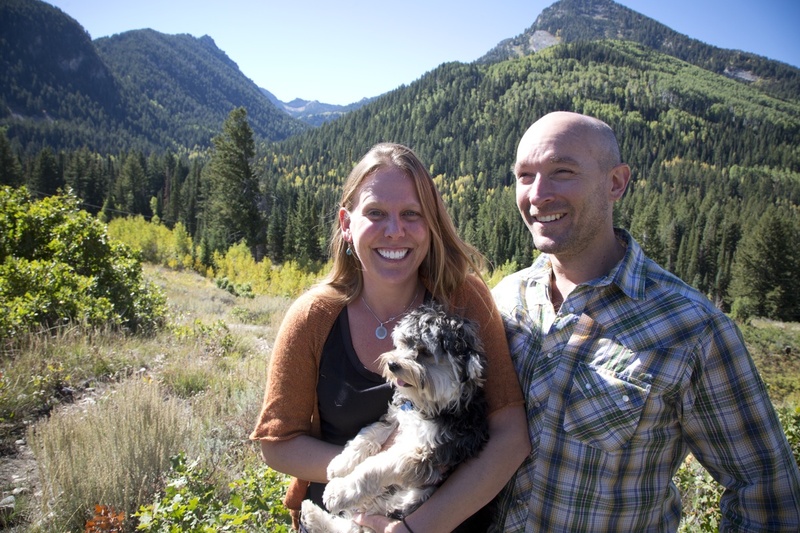 We drove up Big Cottonwood Canyon in the Wasatch Mountains to the year-round cabin of Kathie Taylor (’99 animal ecology) and her husband Robert Andress (MS ’99 geology & water resources). 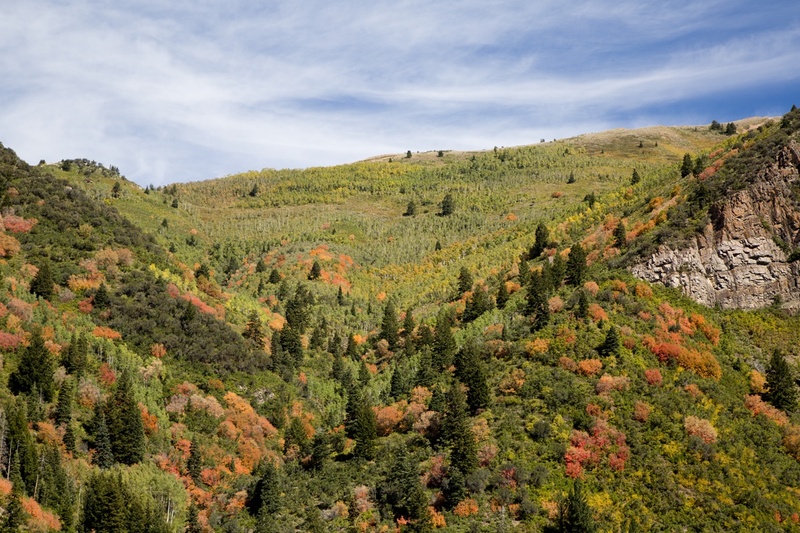 Although the canyon was only a few miles outside Salt Lake City, it was about eight miles up the mountain and it felt a world away from the city. Kathie is an ecological consultant; her company, Argenta, provides services that benefit and conserve native species and naturally functioning ecosystems. So, yeah, she works with frogs and fish and all kinds of cool stuff. Rob is a hydrogeologist who owns Gradient LLC, a company that provides ecological planning, design, and restoration. He and Kathie work together on most of their projects. And they have a very cute dog, Crawford, whom I puppy-sat during the photo shoot. Afterwards, we went to a Mexican restaurant for a late lunch, and it was devine. Tonight we drove to Provo, Utah. I was too tired to enjoy it. 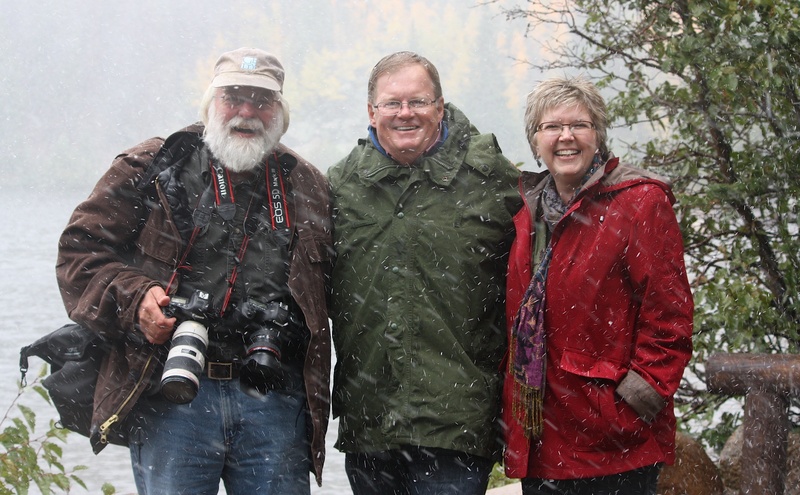 Day 5: Today it snowed at Kathie and Rob’s cabin, so we were glad we’d met with them the day before. I’m learning that in the mountains, fall and winter can be sort of interchangeable, as in: The fall leaves are just now starting to turn, and, oh wait, it’s snowing. We drove southeast to Moab, Utah, this morning and arrived in time to order a late breakfast at a funky café called Peace Tree. I ate huevos rancheros and Jim got a big breakfast burrito with green chile. It was a truly delicious meal. 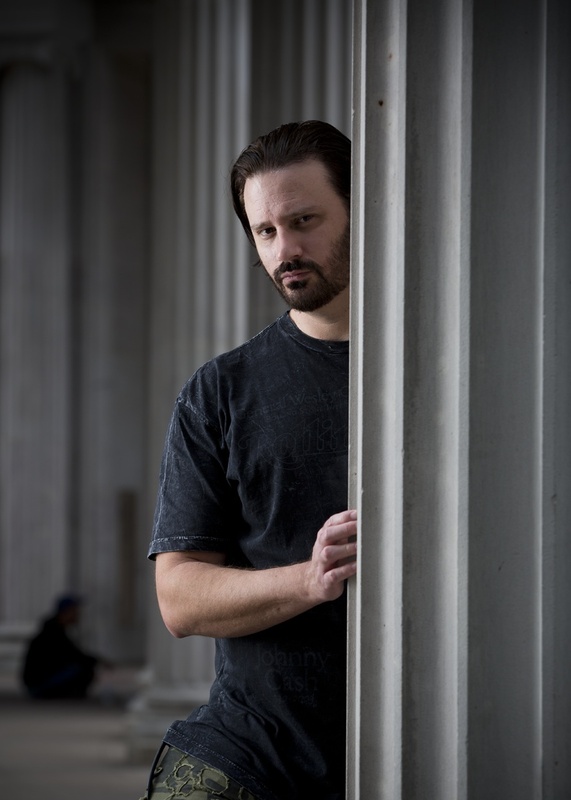 Our idea was to photograph Tom with evening light, but he said that gusty winds were creating a hazy look around the area, so we decided to photograph him the next morning instead. What to do with our extra time? 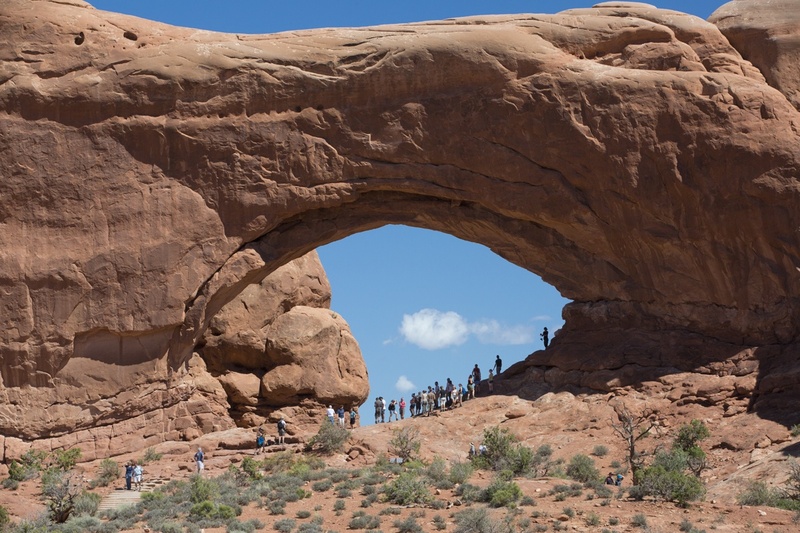 Go Arches National Park, of course. We saw as much as we could and photographed the natural arches and other landforms before returning to the downtown area for our third Mexican meal in a row. Again, it was delicious, but I vowed after that meal not to eat any more Mexican food for awhile. Day 6: We met Tom this morning at our hotel at 6:30 and followed him to Dead Horse Point State Park. When we arrived, the sun was just breaking through, and the photo opportunities were endless. I’m sure Tom would rather have been on the shooting end of the photo shoot, but he was a great sport and took us to the best vantage points with the best light. Dead Horse Point is famous, by the way, as the location for the last scene in the film Thelma & Louise. We left Moab by 10 a.m. (sadly, as I could have spent many days there) and headed back toward Denver. The forecast was for rain later in the day, and we didn’t want to encounter more snow at the higher elevations in our less-than-desirable rental vehicle. (Side note: I requested a 4-wheel-drive SUV and got some kind of minivan/car crossover that was totally impractical for this trip.) We were doing very well on time and enjoying the mountain scenery very much … until we hit Denver traffic and came to a grinding halt for an hour or so. Our destination for tonight was Fort Collins, Colo. I have a friend there, Adam Warren, who used to work with me at Iowa State when he was a student. We originally planned to go “jeeping” with him, before the rain and floods and landslides and our complete change of itinerary. Instead we settled for a pizza and beer. Day 7: This was the trickiest day. Jim and I wanted to take alumnus Pat Reed (’71 outdoor recreation resources), a 42-year National Park Service veteran, to Rocky Mountain National Park. It made perfect sense to photograph him there; he retired last year from the NPS and moved to Fort Collins to be close both to his family and “Rocky,” one of his favorite parks (he worked at about a dozen different National Park sites during his tenure). The Colorado rain and flooding and the closure of Rocky Mountain NP had forced us to delay our visit. Pat kept us up to date on the condition and status of the park: It’s completely closed, it’s partly open, Trail Ridge Road is closed due to snow, it’s open again. Each day brought something new. But on the morning we arrived at Pat’s home in Fort Collins, the news was mostly good: The park is open. You just have to drive a really long way to get there. A drive that normally takes about an hour took us three and a half, down through Denver and back up two-lane mountain roads to the park entrance near Estes Park. But what a beautiful drive! We had rain, mist, fall color, low-hanging clouds…it was great. We learned at the gate entrance that Trail Ridge Road was actually closed, but we were able to go as far as Bear Lake. Jim immediately found a scenic area to photograph Pat. 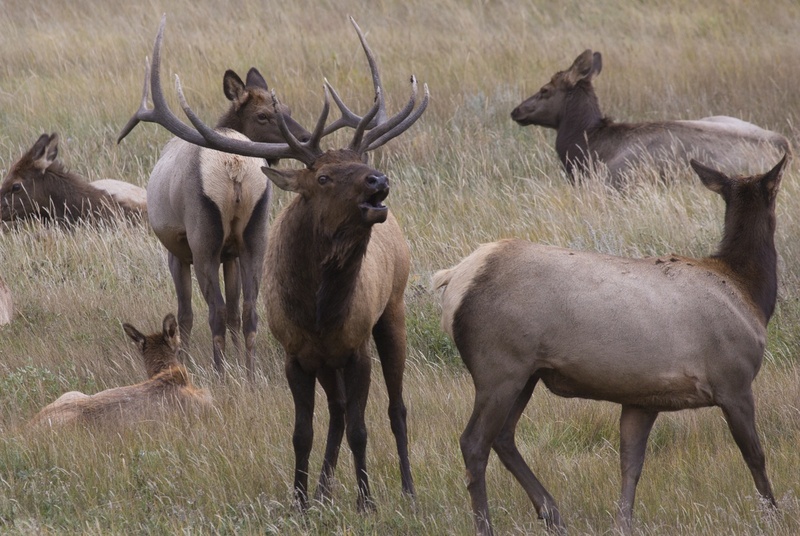 Afterwards we drove around looking for – and finding – elk in rut. They put on quite a show for us. The males were bugling and strutting their stuff for the females everywhere we went. We encountered heavy, wet snow at Bear Lake, as you can clearly see in the photo above. We got really wet and cold but had so much fun! Pat’s a man who knows his park, and he knew just where to take us to show us a good time. Afterward, we went into Estes Park and drank coffee and ate a big breakfast for lunch – before driving four hours back to Fort Collins because we hit Denver right at rush hour. Day 8: We left Fort Collins this morning and drove north to Wyoming. 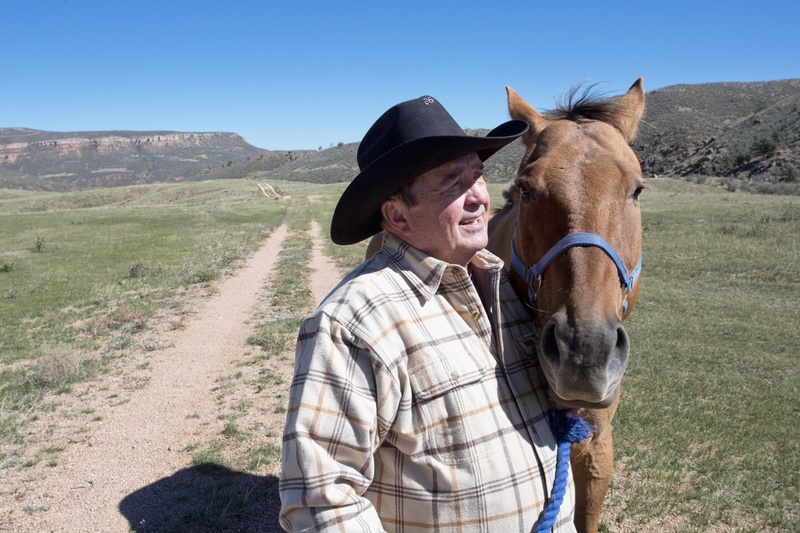 Our day’s plan was to meet with Dennis Steele (PhD ’75 computer science), a college professor and guest-ranching cowboy who runs Bit-O-Wyo Ranch between Cheyenne and Laramie. The ranch road had washed out during the earlier rains, and our crummy car just barely made it up the steep drive. But it did make it. Dennis and his wife, Molly, showed us around the lodge, the show barn, and the horse corral. This is a real working ranch, and during the summer it becomes a dinner-show and trail-riding destination as well as a children’s adventure camp. I was hoping Dennis would get Jim up on a horse, but there were no wranglers working that day so we all ended up keeping both feet on the ground. Later in the day we explored Cheyenne and – surprisingly – found a wonderful New York-style pizza for dinner. Day 9: Our last – and longest – day. Early this morning we met Bill Lindstrom (’79 journalism & mass communication) at his home in Cheyenne. 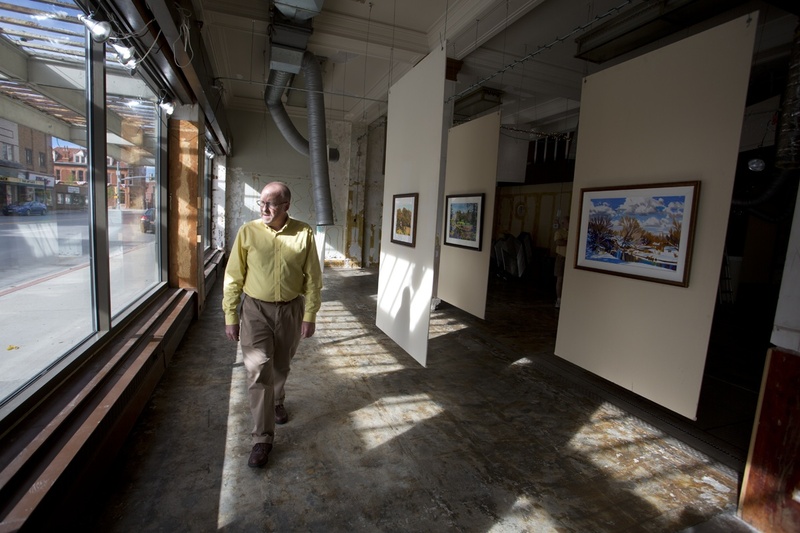 Bill is executive director of Arts Cheyenne, a new arts agency for the greater Cheyenne area. He also has a business called Bevara Digital, which transfers old media to digital format. 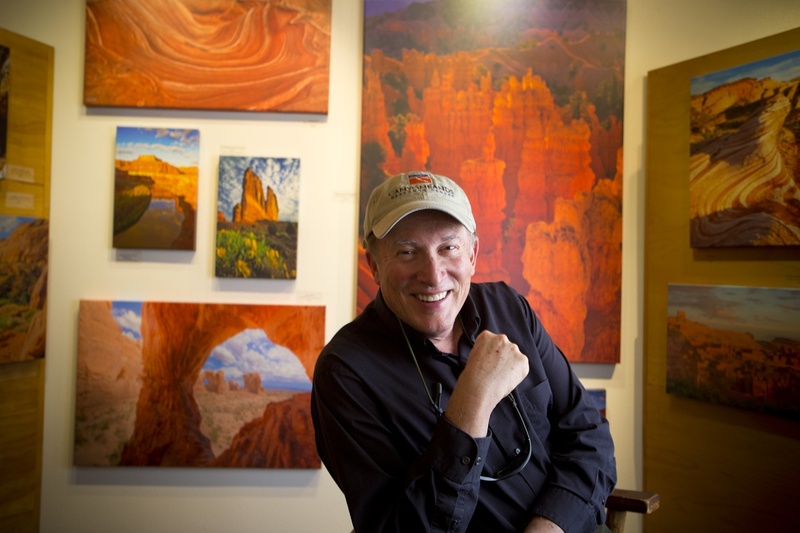 Bill gave us a tour of downtown Cheyenne, with its iconic cowboy boots and train depot, and introduced us to a side of Cheyenne we hadn’t really seen before: the cultural/artistic side. I was chatting happily with Bill in a coffee shop until Jim gave me The Look, which means it’s time to hit the road. It was 11:15, and we had about 700 miles to drive. I won’t bore you with the drive home (mostly gas stations, rest stops, road music, and bad car snacks). We got back to Iowa in record time, even with the time change. So now we’re 49 states complete! Only Iowa remains. We have lots more photos and stories to share with you; we’ve traveled so much the past two months that I’m completely behind on posts from the Pacific Northwest, Missouri, Kansas, and other states. Stay tuned!